In the early years of the Vietnam War, the Viet Cong – small and poor equipped guerrilla groups was at a serious disadvantage when facing modern American forces equipped with the most advanced weapons. However, the difficulties provoked their ingenuity. By utilizing available materials like bamboos or hardwood and a little craftsmanship, they crafted a fearsome weapon called punji sticks which later became one of U.S. foot patrols’ greatest fears. What is a punji stick? A punji stick is a sharpened piece of bamboo with length generally from one to two feet. After hardened by fire, bamboo will hold an extremely sharp point from long periods of time. To increase their wound-potential, the points are often smeared with poison or animal excreta. A punji stick was very easy to make. It could be cut, fashioned even by women and children. Therefore, punji sticks were produced in large quantities in the Vietnam War. 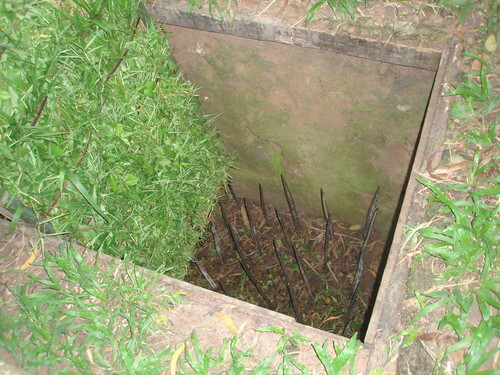 As a kind of trap, punji sticks were perfectly fit in with the condition of South Vietnam. In tropical jungles covered by dense forests and bushes, punji sticks were easy to be camouflaged and often virtually undetectable by enemy. Thus, they would be placed around defense positions, in areas where enemy troops likely to pass through, or in pre-arranged attack areas such as helicopter landing fields. In addition, Viet Cong often used their favorite technique of firing from the jungle tree line to distract enemy troops from the danger hiding right under their feet. The wound caused by a punji stick were seldom fatal, and it was designed to do so. Once an enemy soldier was wounded, it took one or sometimes two soldiers to carry him out of the fight. So instead of killing only one soldier, a single punji stick could take two or three soldiers out of combat. This effectively decreased the numbers of soldiers who were able to fight and simultaneously increased the battle fatigue of those left on the field. Additionally, in cases a fight did not occur, the fear of getting wounded by punji sticks was so great that the soldiers on patrol were under stress the whole time. This distressing situation had caused a long-lasting psychological impact on many Allies soldiers. Punji Sticks were often crafted into multiple variations and punji stick pits were among the most common uses. A punji stick pit was a hole often camouflaged by leaves with punji sticks protruding out of the sides and the bottom. When a soldier fell into a punji pit, he initially got injured by the vertical sticks in the base and then the lateral downward positioned sticks which made his attempts to pull his foot out more difficult. A common variant of punji pit is the punji bear trap. A typical Punji bear trap had two holes, one large and one smaller in the middle where a bear trap was placed. When someone stepped on the bear trap, the weight put on his foot pushed down on the middle of the trap causing bilateral impaling of a lower extremity by multiple sharp points. Most types of punji sticks such as the two types above were only designed to cause wounded on soldier’s legs to delay or disrupt the mobility of enemy forces. However, there were also some kind of punji sticks designed to definitely kill an enemy and side closing trap is one of them. A side closing trap was a little more complicated than a punji pit. It was a large hole covered by a large piece of wood. In the center of the wooden piece, another piece of wood was placed to act as a pivoting point. When weight was put on one end of the trap, it rotated quickly and dropped the person into the hole filled with punji sticks. There were also other kinds of traps made from bamboo. Most of them such as mace trap, whip trap or punji tiltbroad… were also highly effective in causing wound and inflicting casualties on enemy forces. According to a surgical report conducted by the Department of Surgery in 1967, punji sticks had caused the elimination of 324 US troops from combat for an average of three weeks each1. 1. Punji Stick Wounds: Experience with 342 Wounds in 324 Patients in Vietnam, p. 907.